The northern coastal region known as Normandy is in fact the new combination of two former regions – Haute Normandie and Basse Normandie – now merged into one. Normandy has so much to recommend it. Verdant countryside, sandy beaches, picture-postcard charm, a myriad of seafood and white fish, not forgetting cider, Calvados and Camembert; with all this on offer, you can make a allowances for the climate. Normandy is comprised of the departments of Calvados (14), Manche (50), Orne (61), Eure (27) and Seine-Maritime (76). Inland Normandy is classically green and picturesque. Black and white half-timbered farm buildings are interspersed by apple orchards and lush grazing, and the approach to life is laid back. Depending on the season, the coast can have a livelier atmosphere. In the summer, pretty ports such as Honfleur and the upmarket resorts of Deauville and Trouville attract well-heeled visitors in large numbers, seduced by the beaches and boutiques, ritzy restaurants, casinos, polo, and sailing that have earned this area its unofficial name of the “Parisian’s playground”. There’s no shortage of alternatives if you prefer a more down to earth lifestyle, as antique shops, lively street markets and cafés full of character abound in this region.The total population is just over 3,3 million and activity here is mostly agricultural, combined with some industry situated near the large port of Le Havre, the city of Rouen, and the Seine River valley. 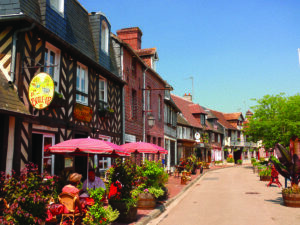 Well-served by sea, road and rail connections, Normandy’s easy access from the UK makes it a favourite with British buyers, and many Parisians have a second home here. Good road links from the tunnel and all the Channel ports make it simple to pop over from the south of England, and low-cost flights from the UK into Paris offer a speedy alternative for a weekend getaway. Normandy provides a great setting, especially for British buyers who are looking for either a second home with ease of access, and those planning a permanent move but who are still looking to be close to friends and family in the UK, and as we mentioned, is also a popular region for weekend homes for Parisians. Pricing for coastal properties will of course be higher compared to properties inland but there is still reasonable pricing for properties on the Contentin or Cherbourg peninsula. You will see quite a difference between pricing in coastal Manche compared to the more expensive department of Calvados, which includes exclusive resorts like Deauville. Expect to pay from €250,000 to €300,000 for coastal houses within walking distance of the beach in areas like Hauteville-sur-Mer. Pricing will increase as you head south along the coast towards Granville and Avranches. Further inland – yet still within easy reach of the coast in areas like Gavray, – pricing becomes more reasonable and village houses can be found starting at €100,000. Traditional stone farmhouses with land start from €200,000 upwards. Renovation enthusiasts can pick up bargains from €50,000.There is excellent rental potential in this region with an abundance of green tourism found in the two regional parks and a number of UNESCO heritage sites to visit. Bayeux and Mont-Saint-Michel are of course the most famous and attract visitors worldwide, as do the beaches and memorials of the Normandy D-Day landings. Hotspot towns in Manche include Avranches and Saint-Lo. The pretty spa town of Bagnoles de l’Orne is another popular area in the Orne as well as Alençon, the capital of the department, and Domfront, surrounded by verdant countryside. Calvados pricing is higher but of course if you look further south, towards areas like Vire and Saint-Sever, you can still find a lot for your budget. Rural properties with land start from €150,000 and properties with gîtes can start from €180,000-€200,000 upwards. The lush green countryside of Normandy that provides the dairy cows with so much goodness is no accident – the region is no stranger to rainfall. Temperature are fairly cool during winter, with mild springs and autumns, and pleasantly temperate summers. For direct travel from the UK, there are plenty of ferry options. Brittany Ferries runs services from Portsmouth to Le Havre, Portsmouth to Caen, Ouistreham and Portsmouth to Cherbourg, while Condor Ferries operates from Portsmouth to Cherbourg during the summer and DFDS Seaways runs services from Newhaven to Dieppe. Meanwhile, Ryanair operates flights from London Stansted to Deauville, while there are also direct flights from the UK into Dinard airport. Flights into Rennes airport in Brittany also give good access to the west of the region. There’s an abundance of farm buildings and barns, land, and lakes for sale here. Normandy features a wide range of property styles. Considering its proximity to Paris and the south coast of the UK, this region still boasts some relatively undiscovered areas, providing property and countryside ideal for equestrian lovers, and outdoor enthusiasts. While house prices in some areas are lower compared to other areas of France, expect to pay a premium the closer you are to good access to the UK. As a rule of thumb anywhere you buy in France, if you are buying a property to renovate, factor in the cost of renovation before you get carried away buying more than you bargained for… literally. Equipped with good advice and a clear head, you will find truly beautiful properties in the Normandy region. Normandy is renowned for horses and is the birthplace in France for haras or stud breeding. Normandy offers some of the best grazing land and soils for stud farms. Make a note of where the top breeding establishments are located. Equestrian enthusiasts looking for property with land have come to the right place, this is most definitely horse country. They countryside offers some of the most spectacular scenery for riding and you can even find properties with direct bridleway access. Speak to your local Mairie who will be able to provide the routes. Planning permission is relatively easy to obtain for equestrian facilities, for example arenas and stabling, if you are also looking to establish a business with the property or expand. Equestrian property with over 1 hectare of land can start from €300,000 upwards, with manor houses and established equestrian centres starting from €400,000 upwards. These are again typically rural properties, but they are more formal and elegant in style compared to the farmhouse. These are country estates and will usually comprise of the central main house and outbuildings surrounded by its own land. Country manor houses with land will start from €450,000 upwards. 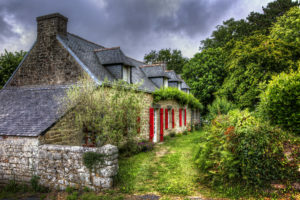 The longère, or stone longhouse, is a prevalent style of property in both Brittany and Normandy. It is commonly a rural property and found throughout the region. They are usually built to protect against the weather and are designed to face away from the prevailing wind. They are usually single storey but many longères have been converted to utilise the attic space. Traditional stone farmhouses are also found throughout the region. Properties in need of work can start from €100,000 and from €150,000 upwards. It is common to find farmhouses with converted outbuildings uses as gîtes and these properties will be more expensive. Picturesque timber framed or colombage house are prevalent across Normandy and reflect the medieval heritage of the region. 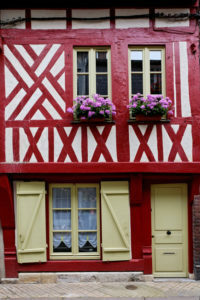 In the pretty port town of Honfleur, colombage style properties can be found from €200,000. Timber framed town houses inland will be cheaper. They are a legacy of the Middle Ages and constructed with local materals using wood and the wattle and daub technique. These properties are sought after due to their traditional feel and prices of course vary depending on size and location. The colombage style can stand alone as an invidual property style but this building method can also be incorporated into longère, farmhouses and outbuildings. Make sure to do your research if renovation is needed on the wooden structure or framework of the building and of course budget is a factor when researching building and material costs. I am considering Normandy for my search for a gîte business. Is this a good area for tourism? Whilst Normandy may not be renowned for its climate compared to the south of France, it certainly has a lot to offer for buyers who are thinking of generating a rental income. The region offers many options for holidaymakers, not only green tourism with its regional parks and lush countryside but also a number of sightseeing spots. The UNESCO sites, including Mont-Saint-Michel and Bayeux, attract millions of worldwide visitors each year. 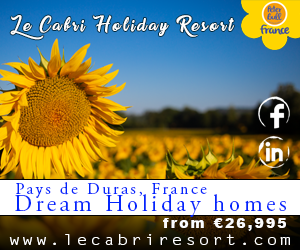 The beaches of the D-Day landings are easily accessible as are the number of coastal stretches for manageable day trips. I have a budget of €150,000 and I am looking for a coastal property, is this achievable? In theory, depending on the size and style of property you are looking for, and distance from the coast, then this is just about realistic. New build properties are available within walking distance, or a few Km of the coast, if you are looking for example at the western Manche on the Cherbourg peninsula. Apartments on the seafront can start from €100,000 if you avoid the more popular touristic towns of Avranches and Granville. If you are willing to look a little further inland, 10km or so, then you will find traditional stone properties within your budget. Of course the degree of work you are willing, or able, to take on will also be a factor. 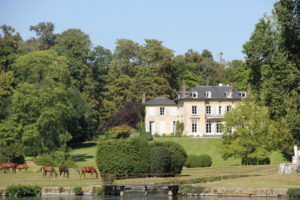 I am looking for a property with land for horses, is Normandy a good area? Normandy has historically been associated with equestrian activities with its expansive countryside and good grazing land. There are numerous training centres, riding schools and stud farms in the area and some of the most renowned equestrians from France and around the world have ties to the region. The region also offers good value for money if you are looking for property with hectares compared to other regions where you would expect to pay a premium. 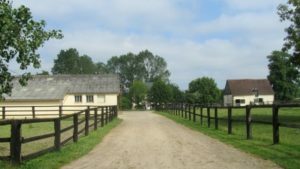 Normandy has something to offer every equestrian enthusiast from the individual equestrian to those looking to establish a riding centre or business venture. If you’ve got your heart set on a French property in stunning Normandy, a phone call to the FrenchEntrée Property team is a great place to start. Did you find this guide useful? 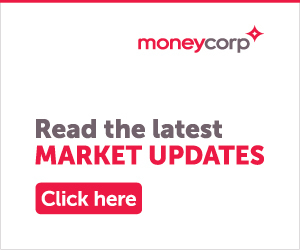 Get FREE regular updates with our French Property, Home & Life newsletter and receive or FREE weekly round up of the newest and best properties for sale. Enter your email address here.